Hi there fellow travellers and welcome to the next challenge here at A Vintage Journey. Jenny here from Pushing The Right Buttons as your host for the next fortnight with a theme designed to get you diving into those Distress Stains. Distress Stains are the best way of getting your favourite Distress Ink colours in liquid form without losing their intensity. That makes them ideal for staining flat surfaces/edges and crackled surfaces, painting, dripping, splatting and so much more. Show us what you can do with your Distress Stains. At A Vintage Journey we ask that the name of our current challenge theme and a direct link to that challenge be included in your blog post. 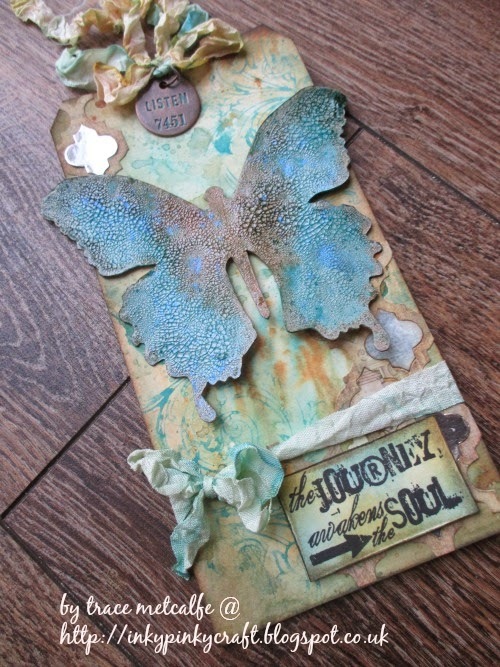 There is so much beautiful art to be shared in our blogging world, but we are a Tim Holtz inspired challenge blog and we need to see a strong Tim Holtz influence in what you produce, using his techniques, projects, ideas or products. Please take a few minutes to look at our Travelling Instructions and also visit Tim's Blog for further inspiration. Our regular sponsor, Country View Crafts, is offering a £10 gift voucher to be redeemed at their online store for one lucky winner and we have a Pinworthy Badge for the Top 3 projects, so why not hop on board! The Creative Guides have made some wonderful pieces to inspire you. Click on their names and you'll be whisked away to each Guide's blog to see how they've been using their Distress Stains. Those of you who know my friend and fellow team mate Anne will be well aware how talented and imaginative she is, so a present for my 'birthday twin' had to be out of the top drawer. This Eileen Hull Mini Album has been cleverly designed to make it a great size and easy to put together. 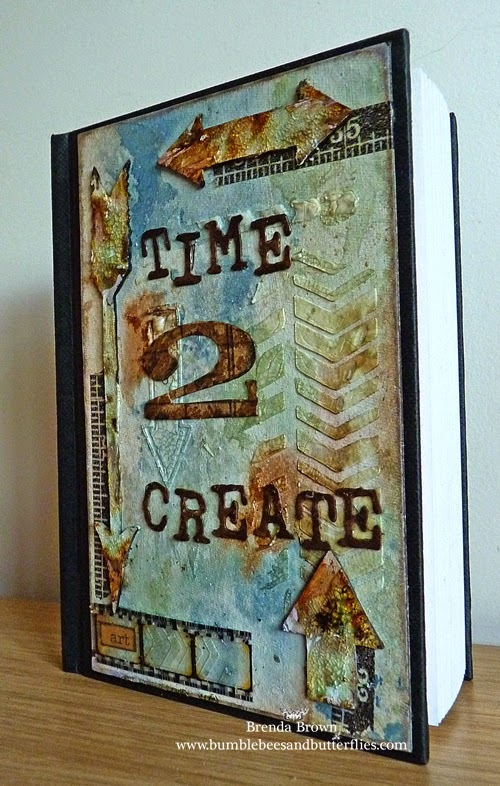 The dilemma (as always) was how to decorate it so, along with many other Tim Holtz products, I delved back through time to the class some of us in the UK were lucky enough to take with Tim last year and figured Distress Stains were definitely the way to go. This is probably the strangest project I've made during a summer but I guess that's the way our crafting goes, particularly if you love Tim's influences. What started out as a floral (tattered pinecone roses) tag turned into a Halloween hanging and all because of Tim's Fired brick DS! LOL Tim shook the world of craft upside down and inside out when he started producing all his wonderful products so I no longer worry about where something takes me, it's all part of MY vintage journey. A detailed step x step and more piccies are over on my own blog if you want further details. I was thrilled to see Jenny use 'Just Stain It' as her choice for this challenge. I love to use stains, particularly for watercolouring and stenciling. I used Tim's wonderful Mini Blueprint 6 set for my card, full details can be seen over on my blog, if you would like to see more. I am quite new to distress stains so this was quite an experiment for me - but great fun. 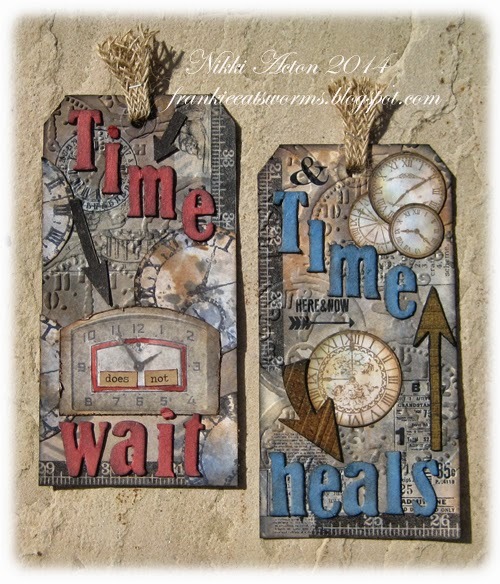 I decided to use my stains to create some backgrounds and then got carried away staining my die cut clocks and arrows, chipboard letters and using them with my paintbrush too. I have a little montage of photos over at A2A - Addicted to Art so do hop over if you would like to see them. 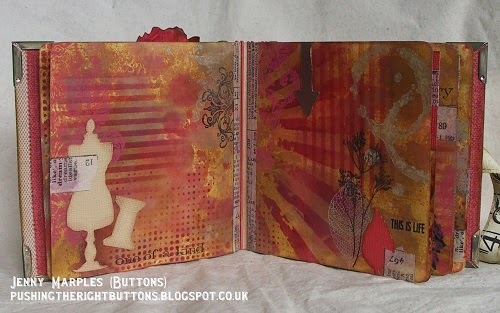 I am into making masterboards for journal covers at the moment and this is one made for a bought sketchbook from a UK chain of shops that sells craft and art products. I used distress stains for all the colouring, over gesso, texture paste and distress crackle paint. They are so versatile and you can use them for many techniques. I love Distress Stains, a great way of applying ink and creating lots of stunning effects varying from backgrounds to embellishments. 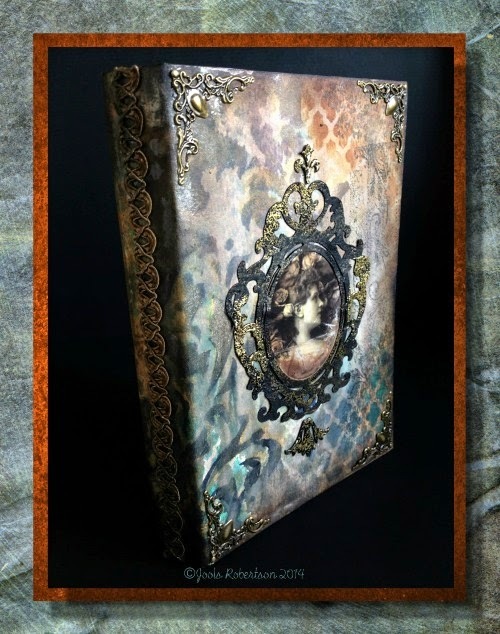 I usually use them for Journal pages, but decided to create pages to decorate a Tim Holtz Configurations Book to see how I used them on my project please visit my blog. I do love playing with those Distress Stains and there are just so many uses for them. For my very large taggy card, I combined the used of stains and Painted Industrial and this was layered up using some of Tim's fabulous paper and other sewing themed goodies. For more information you can visit my blog and thank you. I love the versatility of distress stains..yummy distress colours in a liquid form. 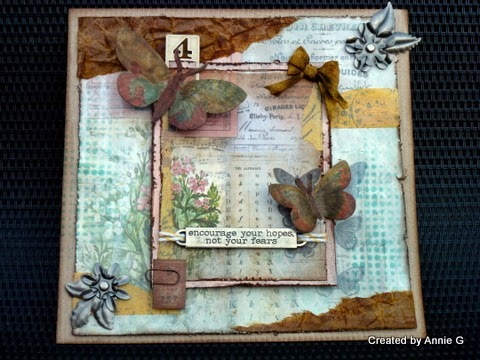 I set too using stains to create the background, stamp with, dye the ribbon and create the focal butterfly..stain was certainly the name of the game..for all the details please see here on my blog. Well I'm sure you'll now have lots of ideas with all that fabulous inspiration from our Creative Guides. Let's see them put into action and shared right here at A Vintage Journey. Don't forget, please make sure you have followed the rules set out in the Travelling Instructions as failure to do so will mean you will not be eligible for the prize draw. And if you would like the Creative Guides to leave a comment on your entry please remember to switch off Word Verification on your blog. What fabulous projects you all created! Jenny this was a fun challenge and great theme! All the DT shared some very creative uses for Distress Stains and a ton of inspiration! Can't wait to see all the entries! Happy Weekend! Such inspiration from a super talented design team. Fantastic designs from everyone. A lovely challenge Jenny! can't wait to get stained! and what wonderful inspiration from all of the ladies! Just been hopping round to see all the fantabulous work from you all - what an amazing team to be a part of! Fantastic examples from the team, wow, fabulous inspiration all round! Fabulous samples from the talented creative team. It seems that the team has done it once again!! Such beautiful projects and all so inspiring. Just loved seeing them .. Can't wait to see what comes along in this challenge from our fellow travelers. Thanks for the beautiful samples, fun challenge and for sharing your creative process! All these examples are stunning D.T.. I so enjoyed the theme and making my guest piece that I have added another here.